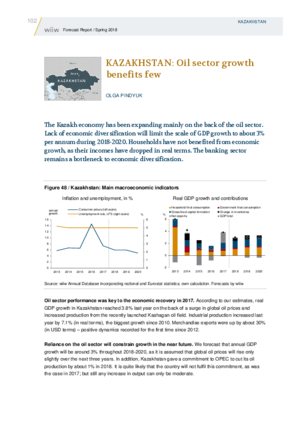 The Kazakh economy has been expanding mainly on the back of the oil sector. Lack of economic diversification will limit the scale of GDP growth to about 3% per annum during 2018-2020. Households have not benefited from economic growth, as their incomes have dropped in real terms. The banking sector remains a bottleneck to economic diversification.